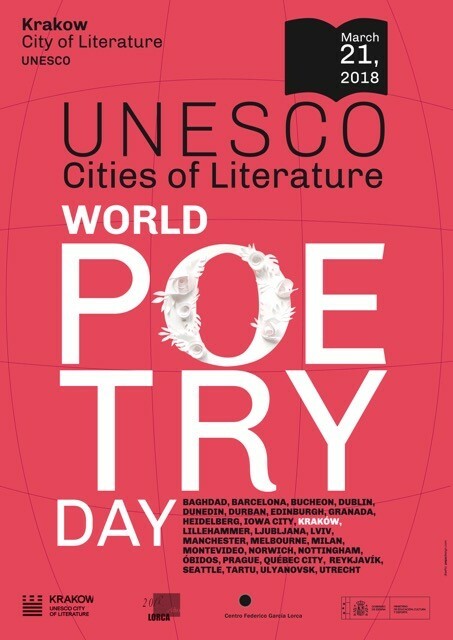 To mark this year’s World Poetry Day, Krakow UNESCO City of Literature and our colleagues across the globe are linking up to hold simultaneous literary events in 13 UNESCO Cities of Literature. Celebrated yearly on March 21st, World Poetry Day is the occasion to honour poets and celebrate one of humanity’s most treasured forms of cultural and linguistic expression. Practiced throughout history – in every culture and on every continent – poetry speaks to our common humanity and our shared values, transforming the simplest of poems into a powerful catalyst for intercultural dialogue and peace. It is an art form that, more than any other, demonstrates the transformative power of words. A long-range poetry recital led by 60 poets in 24 libraries in the city of Granada involving poets from Nottingham and Ljubljana, Georgina Wilding and Anja Golob respectively. Goodwill Ambassador for UNESCO Creative Cities, Italian poet Maria Francesca Merloni, will attend the event. Heidelberg have displayed 45 poems written by 22 poets inside public trams. A special poetic tramwill travel across the city with regular stops, while every 10 minutes another poet will make the ride a poetic journey, reciting poetry to passengers. Similarly, in Tartu, audiences will be taken on a Poetry Route movement across the city with 15 poetry performances taking place in 7 locations. Additional readings involving poets and high school students will be performed throughout the day. A wealth of poetry activities will take place in Krakow including a walking Poetry Song Trail, a multi-poetry presentation of new poems projected on the façade of a building on Bracka St, and the programme announcement of this year’s Milosz Poetry Festival. Heidelberg House in Heidelberg’s French twin city Montpellier will present a poetic evening of German poetry and its impact on today’s French poetic artworks. Barcelona will host a visual poetry workshop and events with Maria Isern and Guillem Gavaldà, prize-winners of the Francesc Garriga Poetry Prize. Poetry events and artistic performances are taking place in Iowa City and Prague. Reykjavik will feature a Children’s Poetry Morning, a Poetic Lunch Hour and finish with a Poetry Happening in the HÓLAVALLAGARÐUR CEMETARY. Obidos at the medieval gate of the town, by local poet Armando da Silva Carvalho. Edinburgh with local poets writing throughout the day and literary podcasts shared on the hour, each one with a different theme and international audience from Edinburgh City of Literature’s Facebook and Twitter channels. Bookshops, coffee shops and the main cultural streets of Baghdad. Krakow a Facebook Live tour of bookstores by a Krakow-based poet. This World Poetry Day, follow the social conversation using #WPD2018 and #CitiesofLitPoetry and experience creative and poetic moments in a City of Literature near you. UNESCO’s City of Literature programme is part of a wider Creative Cities Network that was launched in 2004 and is currently made up of 180 UNESCO Creative Cities globally. As of 2017, the UNESCO Cities of Literature network of 28 cities represents 6 continents and 23 countries, and a combined population of over 26 million, 1250 libraries, 130 literary festivals and over 1200 bookshops. The Network is active in making the literary and creative sectors of cities thrive through the development and implementation of a shared global strategy, which aims to promote the network, share good practice, and ensure that literature reaches diverse audiences. 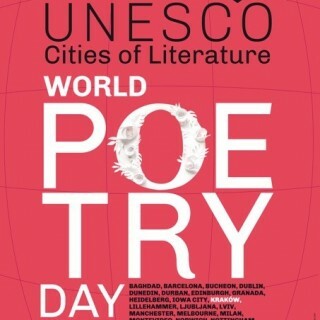 About World Poetry Day: World Poetry Day is on 21 March, and was first declared by UNESCO (the United Nations Educational, Scientific and Cultural Organization) during its 30th General Conference in Paris in 1999, with the aim of supporting linguistic diversity through poetic expression and increasing the opportunity for endangered languages to be heard.